You have to feel for Chairman Powell. He just can’t seem to speak without creating a vicious turbulence in financial markets, first in the Treasury market and then in the US stock market. It doesn’t matter whether he is being hawkish or dovish or whether he is being arrogantly wrong or humbly right. We wonder what he thought when he saw US banks, both money center & regional, virtually taken out & shot in the past two days. His strongest bank, JPMorgan Chase down 7% since the FOMC statement to below $100 and Bank of America down 9% from about 1:45 pm on Wednesday to 26.98 at Friday’s close. And how, we wonder, did he take the waterfall plunge in Treasury rates? Was he happy at the financial easing low rates would create or was he shaken to his core with panic in the Treasury market he had caused? Make no mistake; what he did in October 2018 & then at the December 2018 presser was horribly wrong. And what he did & said on this past FOMC Wednesday, March 20 was totally right (as confirmed by BlackRock’s Rick Rieder on Friday). But the result was the same; Then a panicky sell off in both Treasuries & stocks in October & the worst ever stock selloff in December and now a virtually panicky plunge in Treasury rates & a vicious sell off in stocks on Friday. We can’t recall two market convulsions like this from two consecutive pressers from a Fed Chairman in two consecutive FOMC meetings. We do feel for Jay, yes we do. He looks so sedate but he scares markets as no one we have seen. Jeffrey Gundlach said the Fed seems “almost desperate”. He is right. Fed Chairman Powell seems as desperate as all the King’s horses & King’s men must have seemed as they tried to put Humpty Dumpty together again. That classic tale tells us how easy it is to break an edifice and how difficult or even impossible it is to rebuild it in a way that scars of the break are forgotten. From what we hear from many & from what we see in Q1 data, the vicious, destructive selloff in stocks & the huge rise in interest rates in Q4 caused real damage to US consumers & the US economy. Think! First Powell’s words & actions persuaded many individual investors to sell a portion of their bonds and go into stocks. Then they sold their stock holdings in December because they couldn’t stomach the wealth destruction. Then Powell turned & stocks rallied like crazy to recover the post-October losses. But how many individual investors bought back in January stocks & bonds they had sold in Q4 2018? Not many, we bet. Then, finally, they went back into stocks in the 2nd biggest inflows into stocks during the first week of March only to be shocked again by what Powell said this past Wednesday and by the reaction in stocks to Powell’s words. How does the American investor-consumer feel safe enough to spend in this turbulence? But we understand Powell’s desperation. Because, as Mike Wilson of Morgan Stanley told BTV on Friday, “the growth in the US economy is slowing a lot faster than what you are seeing in corporate profits“. Chairman Powell probably remembers 2007 when the Fed reacted slower than they needed to. They are now determined that “this expansion won’t be murdered by the Fed“, to quote Ben Mandel of JP Morgan on BTV on Friday. But how “determined” is the Fed? Are they as determined to ease as they were when raising interest rates 9 times, far more than any other central bank on earth? And they did QT too. How is this being reflected in liquidity? 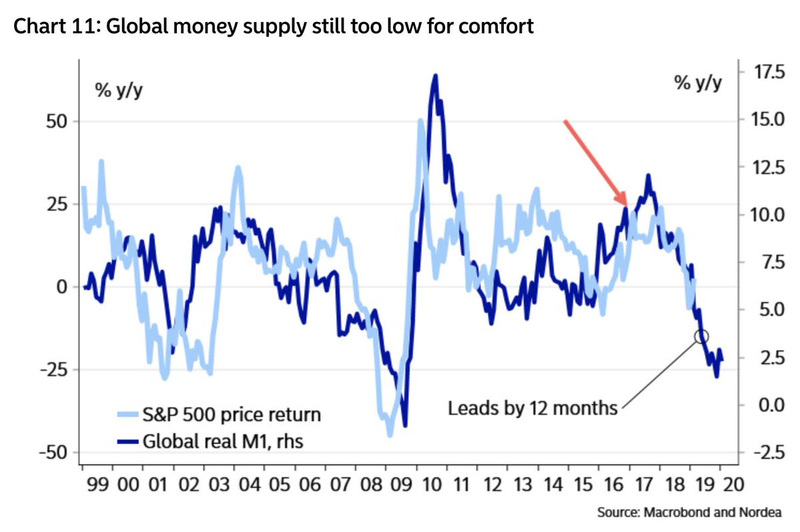 So the US economy is slowing fast, Fed liquidity is still less than global liquidity & global M1 is at its lowest point. How would you put in simple terms? David Rosenberg‏ @EconguyRosie – Peak growth. Peak tightening. Peak yields. Peak inflation. 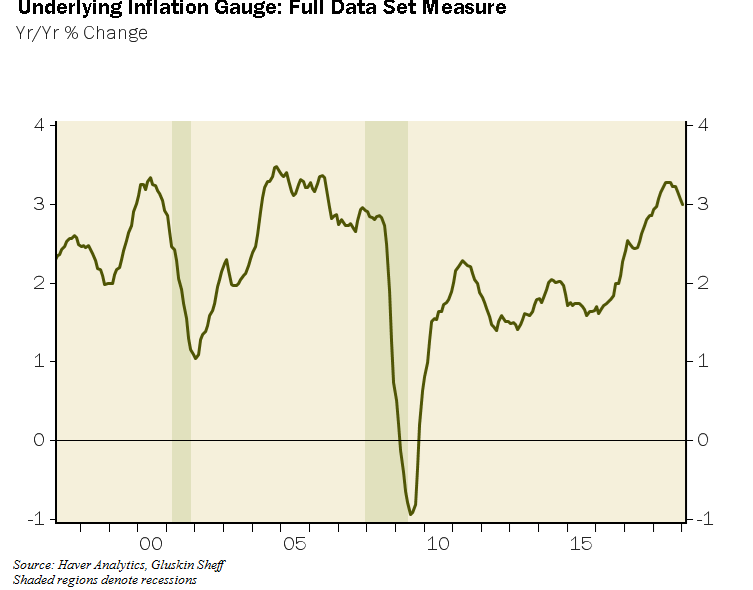 The NY Fed leading inflation indicator is rolling over, as it did ahead of the prior two recessions. Is any one else seeing a recession ahead? The 3-month – 10 year yield curve inverted on Friday. Do you remember what Fed Chairman Greenspan did in October & in early November 1998? He cut interest rates & the November 1998 cut was a surprise rate cut between FOMC meetings. That rate cut convinced the markets and that ended the 1998 scary episode. Yes, the LTCM crisis of 1998 was different but not entirely so. That was about humongous positions that were unwound at scary speeds. Both the speed & intensity of December 2018 sell off and this Friday’s sell off in stocks were also due to way over-bought positions. 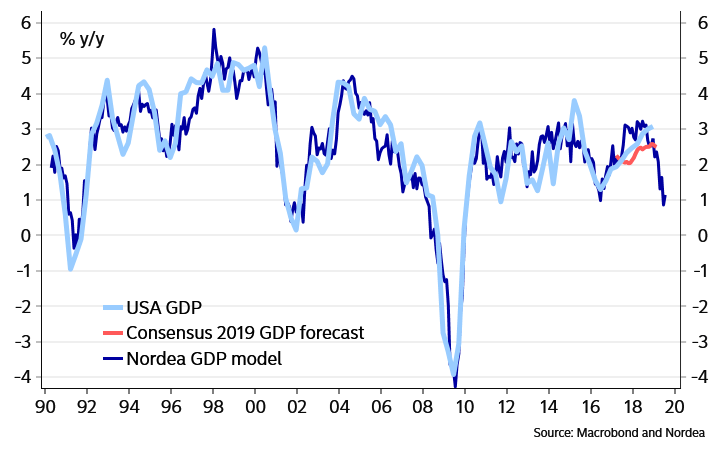 And the 2019 US economy is far far more leveraged than that 1998 US economy. So we go back to what we have said since 2019 began. That the Fed will HAVE to cut interest rates to forestall the onset of recession. And our biggest fear has been that the Fed, as in 2007, would be slower to ease than what is needed. That fear is now exacerbated despite what Chairman Powell said & did this past Wednesday. Think back to December 2018. Why did Chairman Powell change his posture by 180 degrees. He became frightened of what the markets did. What if the stock market sells off next week as it did on Friday? Will he be frightened once again and will he then get less dovish? That is our big fear. Chairman Powell did the right thing this past Wednesday. Now he needs to signal to markets that he will double down if needed and possibly even when if it is not needed. The only way to do so is to CUT interest rates by 25 bps in June and even possibly in April if the data keeps going bad with a subsequent rate cut in June. Both Rick Rieder of BlackRock (on CNBC) and Mike Wilson of Morgan Stanley (on BTV) said on Friday that the data will stabilize/trough in Q2. We hope they are right. But what is the risk in cutting rates to make sure that the data stabilizes/troughs in Q2? Risk that the Fed takes back 1 of its 9 rate hikes? The German 10-year Bund went negative in yield. Terrible as it sounds, the German 10-2 curve is actually very very steep at 60 bps ((-1) 10-yr minus (-61 bps) 2-year). And how steep is the US 10-2 year curve? 12 basis points. So which central bank needs to cut rates & bull-steepen the curve? The central bank that did far more rate hikes than ECB or any other – the Fed. Remember how Q4 2018 featured an extreme short positioning in Treasuries? At that time, specifically in mid-November, a macro guy said Buy Bonds, Wear Diamonds. This quarter and this week has been good to those took that advice of Raoul Pal. So what is he saying now, we wondered. Thanks to the wonderful invention called Twitter, we found out easily. Raoul Pal‏Verified account @RaoulGMI – 2019 is all about this chart. If dollar breaks higher (my view) then things will get even concerning for global growth. A weak dollar will paper over many cracks, however. Time will tell. Some other currencies should fall if the Dollar is to rise, right? Raoul Pal‏Verified account @RaoulGMI – The JPM EM FX Index is very close to breaking key support. This will be another BIG signal, along with DXY over 98. Guess what happened on this past Thursday & Friday. The U.S. Dollar bounced back from immediate post-FOMC weakness on Wednesday to rally on both Thursday & Friday and closed up on the week. The last thing the Fed should want now is a safe haven Dollar drawing in flows from the rest of the world. Another reason for Chairman Powell to cut rates, right? Given the turbulence on Friday, we have no clue what happens early next week. Does the panic in interest rates subside and allow other markets to catch a breath? Or is the shock so big that more come in on Monday to buy more bonds & sell stocks? There is no question Treasury bonds are now way overbought with DSI (Daily Sentiment Index) at 93. 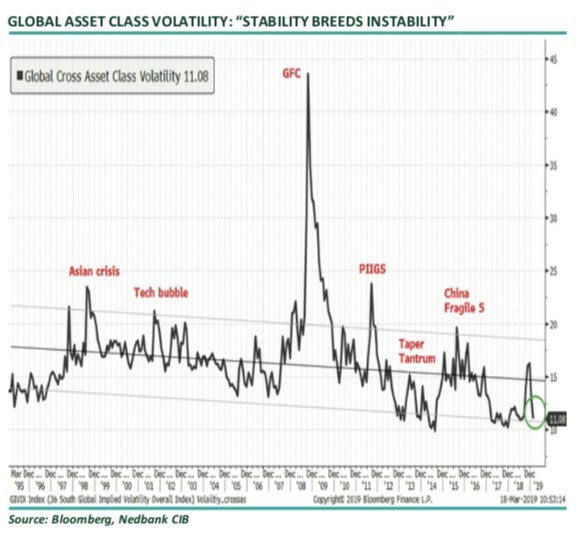 But that may be a short term condition because as Rick Rieder reminded all on Wednesday morning on BTV that “there is a dearth of [quality] bonds relative to the liabilities in the world“. 3. Stephen Moore & Gurumurthy – a parallel? Readers might remember when Urjit Patel, then Governor of the Reserve Bank of India (“RBI”), was at loggerheads with India’s prime minister Modi & his Finance Ministry last quarter. Some hot heads suggested that Modi should fire Patel. Thankfully Modi refused understanding the turmoil that could cause in markets. Instead, he appointed Mr. Gurumurthy, a supporter & an activist for a more dovish RBI, to the central bank’s Board of Governors. Gurumurthy then led his protests from the inside and within a few weeks, Governor Patel resigned. He was then replaced by a veteran insider. The result was a two week strong rally in the Indian Stock market. We remembered this when we read that Stephen Moore is being nominated to the Fed Board as a Governor. We were naturally pleased as we had previously suggested Larry Kudlow as a Fed Governor/Chairman. And Kudlow & Moore are almost brothers in thought if not in blood. More importantly, we were pleased because we think the Fed has morphed into a Tyranny of the Unelected. The problem is compounded by the public arrogance of Jay Powell, not excluding his behavior on 60 Minutes. He may be better & more open than Janet Yellen but he has morphed into a public opponent of President Trump, something Janet Yellen would never do. This is stupid in the best of Fed times and just unabashedly idiotic when Powell has made publicly visible gross mistakes in understanding both the economy & markets. Therefore, we wonder if the nomination of Stephen Moore is a first salvo from President Trump against a publicly arrogant Fed just the way the appointment of Gurumurthy was a first salvo by PM Modi against the then RBI Governor. If so, Chairman Powell needs to get aggressively dovish to prevent any real slowdown in the US economy by cutting rates. If he can prevent a serious slowdown, he is safe otherwise he could end up harming the standing of the institution he swore to protect. And we do think he would resign if he felt he was doing so. Frankly, the saddest commentary on Jay Powell is what Robert Brusca, a NY Fed veteran of late 1970s, said this week. It shows that the Fed bureaucracy (always in love with their models, not so much with markets) always tames the Fed Chairman, as it seems to have done to Powell in 2018.